Timbalive was created in Miami in August 2008, by Leo Garcia (Director, Timbales), offering the best of Cuban Music with a mix of different rhythms from around the world.Based in Miami, and integrated by highly trained musicians from Music Schools in Cuba, Timbalive is one of the largest and most successful group of Timba in United States and the world.Timbalive began recording his first album in May 2009 with the musical production of Bayron Ramos, songs of their own inspiration and other composers. The new album, “From Miami a la Habana” was first available in November 2009. Since the release of his album, Timbalive established itself in the limelight of international music, featuring in the top of the Top 10 charts around the world. The Band was awarded for Album Revelation of the Year 2009 in France, and the Best album of Timba in Peru. During 2009 and 2010 Timbalive toured 2 Times Europe, Mexico, Canada, South America and many States in the Us. 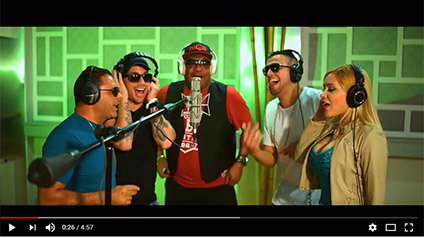 Hits songs like “El Dinero”, “Ave Maria que Calor” and “Como Miami No Hay Na’ ” still sound in radios and Night Clubs worldwide.In 2010,the Band started recording their second album “La Timba Pa to el Mundo” was first available in June 2011. The success of Timbalive achieved in the first 3 years of existence was not at all accidental but the deserved result reached by perseverance, intensive work and found what in the music scene is called “Own Sound” . The sound of Timbalive is an inimitable blend of Caribbean rhythms, Popular Cuban Music, lyrics and arrangements designed for the dancer. The second Album was Nominated for Cubadisco Awards, the most important Awards in Cuba, in the Category: Popular Cuban Music. TimbaLive - "Duplicandote La Dosis" Timbalive Ft "Roberton Van Van"